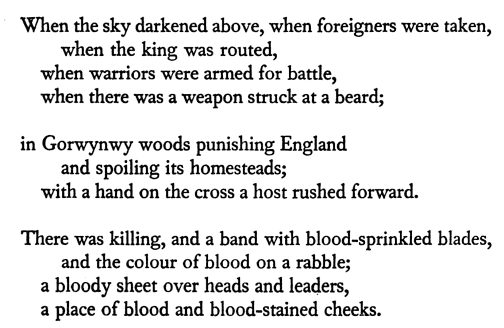 As it is christmas today I thought I’d share with you an extract from the book I’m writing set mainly in 1185 in England. Due to length issues this scene is now unlikely to make it into the final draft, but seeing as a I did quite a bit of research into christmas meals I thought it might be nice to share it here. Just to be clear, this is fiction. The characters are fictional. This particular scene is set in Canterbury in 1184 and features my main characters siblings Marcus and Adele de Bernier celebrating christmas, after a long journey, with two family friends: merchant Peter de Vere and his wife Ela. Along with Peter’s noble cousin Gerbert de Clancy, the men he brought with him and other unnamed guests. Once they had both paid their respects to Becket and prayed to him for success on their journey, Marcus led the way out of the cathedral past the church of St Mary’s of Queningate. As they walked back along the crisp Canterbury streets Adele watched everyone attired in their finery returning to their houses for Christmas feasts. She noticed the greenery that decked some of the houses and the feeling of festive warmth in the air as the wealthy of Canterbury vied to be the best dressed and the most splendid. She spared a thought for Joan and Emma, wondering what they would be doing to celebrate. Adele was glad to reach the de Vere’s house but she was tired and really wanted to just go and rest. She knew she couldn’t disappoint Peter and Ela though, so she painted a smile on her face and followed Marcus to the main hall for the Christmas feast. She sighed in appreciation at the roaring fire and settled down at the same table as their hosts. Adele was delighted to be able to spend more time with Ela and Peter, both of whom she was very genuinely fond of. Unfortunately this also meant that they shared a table with Gerbert de Clancy. Adele was seated next to him and being the only female on the table to whom he was unrelated she was the recipient of his wine sodden confidences and his clumsy attempts at seduction, but she had to pretend to be impressed. The food made up for it a little because Ela had spared no effort. Peter de Vere’s merchant contacts were evident in the quality of the offerings. The wine was Poitivan, brought across the narrow sea by an Aquitanian merchant friend of Peter’s. Adele soon discovered that if she plied Gerbert de Clancy with as much of it as possible he didn’t talk to her so much because he was too busy trying to sit upright. Marcus watched Adele deal adeptly with Gerbert de Clancy, finished off his goose and turned his attention to a sublime chicken dish in which the chicken glowed golden from being rubbed with saffron. He sighed appreciatively as the chicken melted on his tongue. He looked around in delight at what was to come. This was a meal about wealth and prestige. The centerpiece of which was a boar’s head that was ceremoniously being carried in. It still looked menacing even in death and Marcus just knew that the stew made from the rest of the boar would be tender and delectable, so he licked his lips in anticipation. He watched a little apprehensively as the servers handed Peter the boar’s head on its great dish and Peter presented it ceremoniously to Gerbert de Clancy as the highest ranking guest, but as Marcus had feared he was too drunk to do more than just goggle at it in surprise. Just as Marcus was about to do something the servants stepped in adroitly and moved it carefully and quickly back in front of Peter. Crisis averted, Marcus settled back in his seat, his face warm from the fire and his stomach replete with wonderful food. Everything was all right in his world in that moment. There was a hush in the hall, even de Clancy’s drunken retainers quieted, as three subtleties were carried in. As Adele admired the beautiful recreations of the nativity made in marchpane she couldn’t help but agree with Ela’s sentiments. Their beauty almost outweighed de Clancy’s oafishness. Then de Clancy knocked his wine over so it seeped onto her skirts and onto the rushes and suddenly she wasn’t so sure. She carefully wrung the ends of her skirts out, pushed away de Clancy’s clumsy attempts at an apology and, thanking God that her gown was the dark red of good wine and wouldn’t show the stain, returned her attention to the subtleties. The first was the Annunciation, with the Arch Angel Gabriel greeting the Virgin Mary with an Ave, the second was the shepherds watching their flock as the angel appeared to them, and the third, and the largest, was in the stable with Jesus watched over by Mary, Joseph, the animals, the shepherds and the wise men. There was applause and then they all settled down to eat. No one touched the subtleties because, although they were edible, they were so spectacular. Everyone turned their attention to the wafers, cakes and frumenty of which there were plenty. As they began to eat the sweets a singer came in with a harp and started a ballad. Adele was just settling in to what she recognised as the beginnings of Gormond and Isembart when it was interrupted by Gerbert de Clancy passing out face first into his bowl of frumenty. The singer waited as the only two reasonably sober men in the hall, Peter and Marcus, carried him out to his chamber. When the song was finished and dancing was about to begin Marcus and Adele pleaded fatigue and finally retired to their chambers. Urban II’s address at the Council of Clermont calling for the 1st Crusade in 1095, as recorded by Fulcher of Chartres. There is more than one version of this address, this is just the one recorded by Fulcher. “Most beloved brethren: Urged by necessity, I, Urban, by the permission of God chief bishop and prelate over the whole world, have come into these parts as an ambassador with a divine admonition to you, the servants of God. I hoped to find you as faithful and as zealous in the service of God as I had supposed you to be. But if there is in you any deformity or crookedness contrary to God’s law, with divine help I will do my best to remove it. For God has put you as stewards over his family to minister to it. Happy indeed will you be if he finds you faithful in your stewardship. You are called shepherds; see that you do not act as hirelings. But be true shepherds, with your crooks always in your hands. Do not go to sleep, but guard on all sides the flock committed to you. For if through your carelessness or negligence a wolf carries away one of your sheep, you will surely lose the reward laid up for you with God. And after you have been bitterly scourged with remorse for your faults-, you will be fiercely overwhelmed in hell, the abode of death. For according to the gospel you are the salt of the earth [Matt. 5:13]. But if you fall short in your duty, how, it may be asked, can it be salted? O how great the need of salting! It is indeed necessary for you to correct with the salt of wisdom this foolish people which is so devoted to the pleasures of this -world, lest the Lord, when He may wish to speak to them, find them putrefied by their sins unsalted and stinking. For if He, shall find worms, that is, sins, In them, because you have been negligent in your duty, He will command them as worthless to be thrown into the abyss of unclean things. And because you cannot restore to Him His great loss, He will surely condemn you and drive you from His loving presence. But the man who applies this salt should be prudent, provident, modest, learned, peaceable, watchful, pious, just, equitable, and pure. For how can the ignorant teach others? How can the licentious make others modest? And how can the impure make others pure? If anyone hates peace, how can he make others peaceable ? Or if anyone has soiled his hands with baseness, how can he cleanse the impurities of another? We read also that if the blind lead the blind, both will fall into the ditch [Matt. 15:14]. But first correct yourselves, in order that, free from blame , you may be able to correct those who are subject to you. If you wish to be the friends of God, gladly do the things which you know will please Him. You must especially let all matters that pertain to the church be controlled by the law of the church. And be careful that simony does not take root among you, lest both those who buy and those who sell [church offices] be beaten with the scourges of the Lord through narrow streets and driven into the place of destruction and confusion. Keep the church and the clergy in all its grades entirely free from the secular power. See that the tithes that belong to God are faithfully paid from all the produce of the land; let them not be sold or withheld. If anyone seizes a bishop let him be treated as an outlaw. If anyone seizes or robs monks, or clergymen, or nuns, or their servants, or pilgrims, or merchants, let him be anathema [that is, cursed]. Let robbers and incendiaries and all their accomplices be expelled from the church and anthematized. If a man who does not give a part of his goods as alms is punished with the damnation of hell, how should he be punished who robs another of his goods? For thus it happened to the rich man in the gospel [Luke 16:19]; he was not punished because he had stolen the goods of another, but because he had not used well the things which were his. “Although, O sons of God, you have promised more firmly than ever to keep the peace among yourselves and to preserve the rights of the church, there remains still an important work for you to do. Freshly quickened by the divine correction, you must apply the strength of your righteousness to another matter which concerns you as well as God. For your brethren who live in the east are in urgent need of your help, and you must hasten to give them the aid which has often been promised them. For, as the most of you have heard, the Turks and Arabs have attacked them and have conquered the territory of Romania [the Greek empire] as far west as the shore of the Mediterranean and the Hellespont, which is called the Arm of St. George. They have occupied more and more of the lands of those Christians, and have overcome them in seven battles. They have killed and captured many, and have destroyed the churches and devastated the empire. If you permit them to continue thus for awhile with impurity, the faithful of God will be much more widely attacked by them. On this account I, or rather the Lord, beseech you as Christ’s heralds to publish this everywhere and to persuade all people of whatever rank, foot-soldiers and knights, poor and rich, to carry aid promptly to those Christians and to destroy that vile race from the lands of our friends. I say this to those who are present, it meant also for those who are absent. Moreover, Christ commands it. 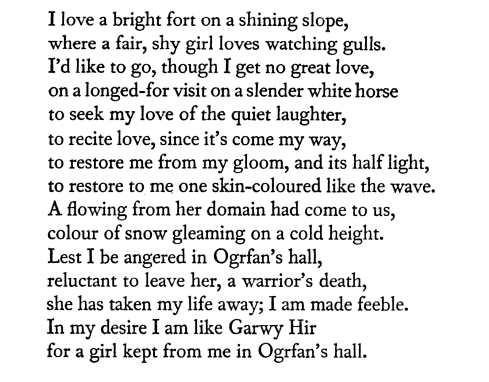 For interests sake I’m including the original welsh of the first 6 lines of Ode V. Poems really need to be read in their original language to get a true sense of the work. I’m not 100% certain of its veracity as I don’t read welsh and it is from wikiquote, I generally try to find other sources but in this case I can’t find another welsh version anywhere. Nevertheless it is still interesting. yd garwny uyned, kenym cared yn rwy. y adrawt caru, can doeth yn rann. “How the king and queen of the English were crowned at Canterbury. Extract from a letter from Heloise to Abelard. “I have your picture in my room; I never pass it without stopping to look at it; and yet when you are present with me I scarce ever cast my eyes on it. If a picture, which is but a mute representation of an object, can give such pleasure, what cannot letters inspire? They have souls; they can speak; they have in them all that force which expresses the transports of the heart; they have all the fire of our passions, they can raise them as much as if the persons themselves were present; they have all the tenderness and the delicacy of speech, and sometimes even a boldness of expression beyond it. From the love letters of Abelard and Heloise. Guibert was dedicated to the church.